4.5 MILLION JEWISH ADULTS MURDERED IN THE HOLOCAUST? Survivors in this section talk about life before the Holocaust. They encounter anti-Semitic prejudice and discrimination. They talk about the loss of various rights once anti-Jewish decrees are established. Some speak of their childhood memories, such as having to leave their homes in Germany to travel to England on the Kindertransport . Jack Kagan describes occupation and the arrival of the Einatzkommando in his town, as violence towards the Jews escalates. The Nazis used propaganda campaigns to promote the party's virulent hatred of Jews. This attitude towards Jews is known as anti-Semitism. It can take different forms - institutional, physical or verbal. The Nazis wanted to portray the Jews as sub-human, inferior beings who were interested primarily in their own economic gain or in communism. The Nazis built upon the negative myths of the Jewish race which had existed for centuries. Hitler used the Jews as a scapegoat, blaming them for Germany's economic and social problems. The Nazi party promised to resolve these issues, and in 1932 won 37% of the vote. The persecution of the Jews began systematically, shortly after Hitler came to power. The Nazis introduced anti-Jewish decrees, which gradually eliminated the rights of Jewish citizens. Jews were regularly persecuted and humiliated. Many members of the German public were bystanders and did nothing to condemn the Nazi racial policies. This may have been due to the fact that they were content with other Nazi policies, which appeared to improve the disastrous financial and economic conditions in Germany. People were also afraid to speak out, as they were terrified of the brutality of the Nazis. All Jews and non-Aryans were excluded from Germany society. They could no longer hold government jobs, own property or run their own businesses. In 1935, when the government passed the Nuremberg Laws that declared that only Aryans could be German citizens. The Nazis believed that the 'pure-blooded' German was racially superior, and that a struggle for survival existed between the German race and those races considered to be inferior. They saw Jews, Roma and Sinti (Gypsies), black people and the disabled as a serious biological threat to the purity of the German-Aryan race, which they called the 'Master Race'. The Nazis idea of a perfect Aryan was someone with Nordic feature such as being tall or having blonde hair or blue-eyes. The German Jewish community had contributed a great deal to German society culturally, economically and socially. Many Jews were patriotic Germans, and had sacrificed their lives for their country in WWI. For example, survivor Trude Levi's father fought for Germany during the 1914-1918 conflict and was granted medals for serving the country. In her oral testimony in Topic 1 she describes how her father was told to return his medals and that his Hungarian citizenship had been revoked. There were those who managed to leave the country as refugees - these people usually needed money and a permit to allow them to emigrate to other countries. A conference was held in Evian, France, in July 1935. 32 countries, including Great Britain, met to discuss the refugee crisis. Most countries refused to accept more Jewish refugees. They claimed admitting more refugees would lead to over population, unemployment and further anti-Semitism. Great Britain insisted that those Jews wanting to emigrate had first to prove they had a job to go to in the host country, or that they had sufficient funds to live on. In 1938 a special scheme was established called the Kindertransport (children's transport). It allowed 10,000 Jewish children and children of other Nazi victims into Great Britain. Many countries had strict quotas and, although many Jews escaped before the start of the war, some Jews were sent back to Nazi Europe. A survivor, Anon, in Topic 1 describes preparing for arrival in England and discusses how she was received by her foster family. Most of the 9,354 Kindertransport children never saw their parents again. The German occupation of Europe began in March 1938 with the annexation of Austria (Anschluss). The occupation of Poland on September 1st 1939 was the trigger for the start of WWII. As other countries were occupied, the Nazis quickly established the anti-Jewish decrees. These included compulsory wearing of yellow stars and the establishment of the ghettos. In June 1941, Hitler broke his pact (10 years of non-aggression) with the Soviet Union and ordered an invasion using overwhelming force. 2000 SS, Gestapo and German police were joined by Romanians, Ukranians, Latvians and Lithuanians who followed the German army of 5.5 million men.They formed mobile killing squads called Einsatzgruppen and were responsible for the murder of approximately 2 million Jews and thousands of Roma and Sinti( Gypsies). This was the start of the Holocaust. According to the census of June 1933, the Jewish population of Germany consisted of about 500,000 people. Jews represented less than one percent of the total German population of about 67 million people. Unlike ordinary census-taking methods, the Nazi racist criteria codified in the Nuremberg Laws of 1935 and subsequent ordinances identified Jews according to the religion practiced by an individual's grandparents. Consequently, the Nazis classified as Jews thousands of people who had converted from Judaism to another religion, among them even Roman Catholic priests and nuns and Protestant ministers whose grandparents were Jewish. Eighty percent of the Jews in Germany (about 400,000 people) held German citizenship. The remainder were mostly Jews of Polish citizenship, many of whom were born in Germany and who had permanent resident status in Germany. In all, about 70 percent of the Jews in Germany lived in urban areas. Fifty percent of all Jews lived in the 10 largest German cities, including Berlin (about 160,000), Frankfurt am Main (about 26,000), Breslau (about 20,000), Hamburg (about 17,000), Cologne (about 15,000), Hannover (about 13,000), and Leipzig (about 12,000). At 10:00 a.m., members of the Storm Troopers (SA) and SS (the elite guard of the Nazi state) stand in front of Jewish-owned businesses throughout Germany to inform the public that the proprietors of these establishments are Jewish. The word "Jude," German for "Jew," is often smeared on store display windows, with a Star of David painted in yellow and black across the doors. Anti-Jewish signs accompany these slogans. In some towns, the SA march through the streets singing anti-Jewish slogans and party songs. In other towns, violence accompanies the boycott; in Kiel, a Jewish lawyer is killed. The boycott ends at midnight. Boycotts organized at the local level continue throughout much of the 1930s. At their annual party rally, the Nazis announce new laws that make Jews second-class citizens and revoke most of their political rights. Further, Jews are prohibited from marrying or having sexual relations with persons of "German or related blood." "Racial infamy," as this becomes known, is made a criminal offense. The Nuremberg Laws define a "Jew" as someone with three or four Jewish grandparents or who is a practicing Jew. Consequently, the Nazis classify as Jews thousands of people who have converted from Judaism to another religion, among them even Roman Catholic priests and nuns and Protestant ministers whose grandparents were Jewish. In reponse to the murder of German diplomat Ernst vom Rath by a young Jew in Paris, German propaganda minister Joseph Goebbels delivers a fiery speech to the Nazi party faithful in Munich; these party members are gathered to commemorate the anniversary of the abortive 1923 Beer Hall Putsch (Adolf Hitler's first attempt to seize power). The speech is a signal for an organized assault upon Jewish homes, businesses, and places of worship by members of the SA, SS, and other Nazi party organizations such as the Hitler Youth. Although Nazi officials later portray the pogrom as a spontaneous act of public outrage, the population's participation in the pogrom is limited. The violence against Jews lasts into the morning of November 10 and becomes known as Kristallnacht: the "Night of Broken Glass." At least 91 Jews are killed and up to 30,000 more are arrested and confined in concentration camps. "Aryanization," the transfer of Jewish-owned businesses to "Aryans," accelerates following the pogrom. When the Nazis came to power in Germany in 1933, Jews were living in every country of Europe. A total of roughly nine million Jews lived in the countries that would be occupied by Germany during World War II. By the end of the war, two out of every three of these Jews would be dead, and European Jewish life would be changed forever. In 1933 the largest Jewish populations were concentrated in eastern Europe, including Poland, the Soviet Union, Hungary, and Romania. Many of the Jews of eastern Europe lived in predominantly Jewish towns or villages, called shtetls. Eastern European Jews lived a separate life as a minority within the culture of the majority. They spoke their own language, Yiddish, which combines elements of German and Hebrew. They read Yiddish books, and attended Yiddish theater and movies. Although many younger Jews in larger towns were beginning to adopt modern ways and dress, older people often dressed traditionally, the men wearing hats or caps, and the women modestly covering their hair with wigs or kerchiefs. In comparison, the Jews in western Europe—Germany, France, Italy, the Netherlands, and Belgium—made up much less of the population and tended to adopt the culture of their non-Jewish neighbors. They dressed and talked like their countrymen, and traditional religious practices and Yiddish culture played a less important part in their lives. They tended to have had more formal education than eastern European Jews and to live in towns or cities. Jews could be found in all walks of life, as farmers, tailors, seamstresses, factory hands, accountants, doctors, teachers, and small-business owners. Some families were wealthy; many more were poor. Many children ended their schooling early to work in a craft or trade; others looked forward to continuing their education at the university level. Still, whatever their differences, they were the same in one respect: by the 1930s, with the rise of the Nazis to power in Germany, they all became potential victims, and their lives were forever changed. The term "emancipation of Jews" means the removal of all legal discrimination against Jews and the granting of rights equal to those of other citizens in a country. In September 1791, the National Assembly of France granted rights of citizenship to Jews who took a loyalty oath. France was in the vanguard of the emancipation movement. For example, Jews were only later emancipated in Greece (1830), Great Britain (1858), Italy (1870), Germany (1871), and Norway (1891). Although civil equality for Jews was thus guaranteed by law, European Jewry remained beset by antisemitism and social discrimination. Walter Rathenau, one of the most prominent Jewish political figures of the Weimar Republic, is assassinated by right-wing radicals. Rathenau, the president of the General Electric Corporation of Germany (AEG) since 1915, became foreign minister of the Weimar Republic in 1922. As a Jew, he was hated by right-wing groups particularly for his policy of fulfilling the terms of the Treaty of Versailles and his normalization of relations with the Soviet Union. His murder is indicative of the right-wing antisemitic campaign blaming Jews for Germany's defeat in World War I. Violence erupts in Poland. Three Jews are killed and more than sixty wounded in the town of Przytyk, Poland. In the days following the attack, the pogrom spreads to neighboring towns. Before the pogrom is ended, almost 80 Jews are killed and over 200 wounded. Violence against Jews is widespread throughout central Poland between 1935 and 1937. Anti-Jewish pogroms take place, for example, in Czestochowa, Lublin, Bialystok, and Grodno. Antisemitism is a starting place for trying to understand the tragedy that would befall countless numbers of people during the Holocaust. The word antisemitism means prejudice against or hatred of Jews. The Holocaust, the state-sponsored persecution and murder of European Jews by Nazi Germany and its collaborators between 1933 and 1945, is history’s most extreme example of antisemitism. Throughout history Jews have faced prejudice and discrimination, known as antisemitism. Driven nearly two thousand years ago by the Romans from the land now called Israel, they spread throughout the globe and tried to retain their unique beliefs and culture while living as a minority. In some countries Jews were welcomed, and they enjoyed long periods of peace with their neighbors. In European societies where the population was primarily Christian, Jews found themselves increasingly isolated as outsiders. Jews do not share the Christian belief that Jesus is the Son of God, and many Christians considered this refusal to accept Jesus' divinity as arrogant. For centuries the Church taught that Jews were responsible for Jesus' death, not recognizing, as most historians do today, that Jesus was executed by the Roman government because officials viewed him as a political threat to their rule. Added to religious conflicts were economic ones. Rulers placed restrictions on Jews, barring them from holding certain jobs and from owning land. At the same time, since the early Church did not permit usury (lending money at interest), Jews came to fill the vital (but unpopular) role of moneylenders for the Christian majority. In more desperate times, Jews became scapegoats for many problems people suffered. For example, they were blamed for causing the "Black Death," the plague that killed thousands of people throughout Europe during the Middle Ages. In Spain in the 1400s, Jews were forced to convert to Christianity, leave the country, or be executed. In Russia and Poland in the late 1800s the government organized or did not prevent violent attacks on Jewish neighborhoods, called pogroms, in which mobs murdered Jews and looted their homes and stores. As ideas of political equality and freedom spread in western Europe during the 1800s, Jews became almost equal citizens under the law. At the same time, however, new forms of antisemitism emerged. European leaders who wanted to establish colonies in Africa and Asia argued that whites were superior to other races and therefore had to spread and take over the "weaker" and "less civilized" races. Some writers applied this argument to Jews, too, mistakenly defining Jews as a race of people called Semites who shared common blood and physical features. This kind of racial antisemitism meant that Jews remained Jews by race even if they converted to Christianity. Some politicians began using the idea of racial superiority in their campaigns as a way to get votes. Karl Lueger (1844-1910) was one such politician. He became Mayor of Vienna, Austria, at the end of the century through the use of antisemitism -- he appealed to voters by blaming Jews for bad economic times. Lueger was a hero to a young man named Adolf Hitler, who was born in Austria in 1889. Hitler's ideas, including his views of Jews, were shaped during the years he lived in Vienna, where he studied Lueger's tactics and the antisemitic newspapers and pamphlets that multiplied during Lueger's long rule. In France, a member of the Russian secret police concocts the Protocols of the Elders of Zion. The Protocols promote claims that there exists a Jewish conspiracy to take over the world. These forged documents are presented as the minutes of a supposed meeting of world Jewish leaders in which they finalized plans to dominate the world, and suggest that Jews have formed secret organizations and agencies through which they aim to control and manipulate political parties, the economy, the press, and public opinion. The Protocols are published in countries throughout the world, including the United States, and used by antisemites to reinforce claims of a Jewish conspiracy. In the 1920s and 1930s, the Protocols are used to gain support for Nazi party antisemitic ideology and policies. Captain Alfred Dreyfus, a Jewish officer in the French army, is arrested and falsely accused of handing over to Germany documents involving the national defense of France. After a summary trial before a military court, Dreyfus is found guilty of treason and sentenced to life imprisonment on Devil's Island, located off the coast of French Guiana. This case divides the French nation into two opposing groups: those who insist that Dreyfus is guilty (conservatives, nationalists, and antisemitic groups), and those who insist that Dreyfus should receive a fair trial (liberals and intellectuals). In 1899, Dreyfus receives a new trial, but is again found guilty by a military court. However, the president of the French Republic intervenes, granting him a pardon. Shortly before World War I, Dreyfus is fully vindicated by a civilian court. The controversy surrounding the Dreyfus affair reflects latent antisemitism in the French officer corps and other conservative French groups. Karl Lueger is elected mayor of Vienna. He holds this position for 13 years, until his death in 1910. Lueger, co-founder of the Christian Socialist party, uses economic antisemitism to gain support from the small businessmen and artisans who are suffering after the surge of capitalism during the industrial revolution in Austria. He claims that Jews have a monopoly on capitalism and that they thus compete unfairly in the economic arena. This form of antisemitism is used by other right-wing parties in Austria and Germany in the early twentieth century as a means to broaden their popular appeal. Adolf Hitler, a resident of Vienna during Lueger's mayoral reign, is greatly influenced both by Lueger's antisemitism and by his ability to rally public support. Lueger's ideas are reflected in the Nazi party platform in 1920s Germany. 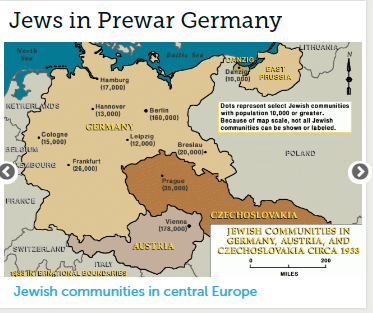 In 1933, about 500,000 Jews lived in Germany, less than one percent of the total population. Most Jews in Germany were proud to be Germans, citizens of a country that had produced many great poets, writers, musicians, and artists. More than 100,000 German Jews had served in the German army during World War I, and many were decorated for bravery. Jews held important positions in government and taught in Germany's great universities. Of the thirty-eight Nobel Prizes won by German writers and scientists between 1905 and 1936, fourteen went to Jews. Marriage between Jews and non-Jews was becoming more common. Although German Jews continued to encounter some discrimination in their social lives and professional careers, most were confident of their future as Germans. They spoke the German language and regarded Germany as their home. When the Nazis came to power, the lives of German Jews changed drastically. On April 1, 1933, the Nazis carried out the first nationwide, planned action against them: a boycott of Jewish businesses. Nazi spokesmen claimed the boycott was an act of revenge against both German Jews and foreigners, including US and English journalists, who had criticized the Nazi regime. On the day of the boycott, Storm Troopers stood menacingly in front of Jewish-owned shops. The six-pointed "Star of David " was painted in yellow and black across thousands of doors and windows. Signs were posted saying "Don't Buy from Jews" and "The Jews Are Our Misfortune." The nationwide boycott was not very successful and lasted just a day, but it marked the beginning of a nationwide campaign by the Nazi party against the entire German Jewish population. A week later, the government passed a law restricting employment in the civil service to "Aryans." Jewish government workers, including teachers in public schools and universities were fired. The SA (Storm Troopers) attack Jewish-owned department stores in German cities in an attempt to segregate Jews from the rest of society. Local police, not yet under Nazi control, unsuccessfully attempt to stop the attacks. Members of the SA continue the rampage and enter courtrooms, dragging Jewish lawyers and judges into the streets where they are subjected to humiliating public acts. These attacks are publicized by international Jewish organizations and the press, which urge a boycott of German goods. In response, the Nazis organize a nationwide boycott of Jewish businesses in Germany, blaming Jews for anti-German tone of the international press. At 10:00 a.m., SA and SS members stand in front of Jewish-owned businesses throughout Germany to inform the public that the proprietors of these establishments are Jewish. The word "Jude," German for "Jew," is often smeared on store display windows, with a Star of David painted in yellow and black across the doors. Anti-Jewish signs accompany these slogans. In some towns, the SA marches through the streets singing anti-Jewish slogans and party songs. In other towns, violence accompanies the boycott; in Kiel, a Jewish lawyer is killed. The official boycott ends at midnight. The Nazi government enacts the Law for the Restoration of the Professional Civil Service. This law seeks to exclude those considered to be opponents of the Nazi state—Jews and political opponents. As a result, civil service employees are forced to prove their "Aryan" descent by documenting the religion of their parents and grandparents. If unable to do so, they are dismissed from service. Hitler reluctantly concedes to President Paul von Hindenburg's demand to exempt from dismissal those civil servants who are veterans of World War I or whose close relatives had fallen in that conflict. Similar laws passed in the following weeks affect Jewish lawyers and doctors.